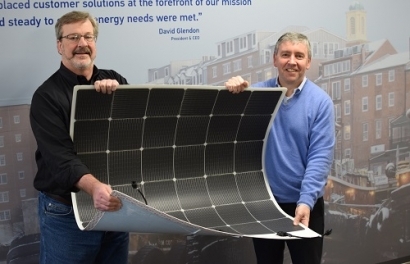 Sprague Operating Resources, a subsidiary of New Hampshire-based Sprague Resources, and Picktricity, have teamed up to produce thin-film solar panels, unique in that they can be directly applied to flat surfaces. Picktricity, a Massachusetts-based installer of thin-film solar panels, originally approached Sprague to apply the adhesive solar panels to one of its tanks in 2017. The thin-film panels are significantly more flexible and lighter in weight than traditional panels, which also require the additional weight of racks and bolts for installation. Sprague, a well-known pioneer in the energy industry, agreed to a pilot program, and quickly saw positive results. “Many of the options available allow terminal owners to receive power savings and environmental benefits without the requirement of capital investment,” said David Glendon, president and chief executive officer at Sprague. Picktricity offers a full suite of solar solutions, including connecting customers to project financing options, which can minimize or eliminate the capital cost of the installation. Photo Caption: Kevin Maloney, CEO of Picktricity, and David Glendon, CEO and President of Sprague hold one of the solar panels applied to Sprague’s South Portland, Maine, terminal tank.